The cleaning of your easel painting can include surface cleaning or alternatively varnish removal. Surface cleaning refers to the removal of surface dirt and grime from your painting without affecting the varnish layer. Treatment aims to aesthetically improve the painting, remove dirt and grease to prepare the surface for the solvent action of varnish removal, and to prevent surface dirt becoming engrained in the painting. It is crucial that prior to surface cleaning, the paint layer is secure and does not present loose or flaking paint. Before surface cleaning, the back of your painting should additionally be cleaned to prevent the dirt particles from becoming embedded in the layers of the canvas. To surface clean the back of your painting, feathers and brushes are used to remove the dirt from behind the stretcher bars. It is important to remove loose objects such as dirt, pine kernels, nails as items trapped in this space between the stretcher bar and canvas may cause distortions in the painting. A soft bristle brush and vacuum is then used to remove further surface dirt and dust from the canvas. Conservation standard dry cleaning materials, for example Chemical Sponge or Groom/Stick may then be applied to the canvas and stretcher to remove more ingrained surface dirt. What materials are used to surface clean an oil painting? 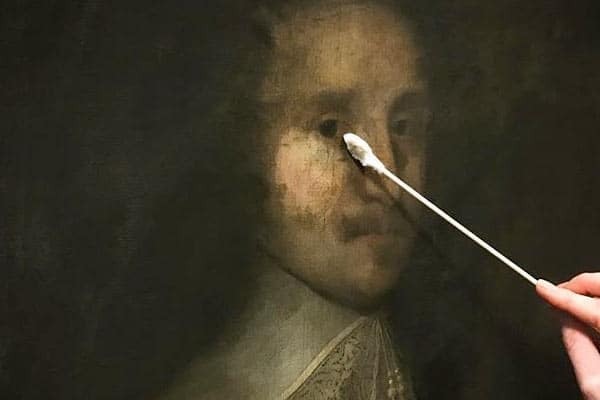 The least invasive material that successfully removes surface dirt and grime from the surface of the oil painting should be selected. Common materials used for surface cleaning include de-ionised water, Tri-Ammonium Citrate (1-4% in de-ionised water), or Ammonia Hydroxide (pH 8-9). The cleaning materials are delivered by swab action for control and to ensure an even clean. Can I clean my painting with bread? Contrary to methods widely circulated across internet searches, your painting should NOT be cleaned with bread. The risks associated include mechanical damages to the painting as well as residue which can attract bacterial activity including pests and mould growth. Following surface cleaning, varnish removal seeks to address the discolouration (often yellowing) of the varnish from the painting surface. Yellowing of traditional resin varnishes is not uncommon and can affect the legibility of the piece as it obscures the details of the painting. A yellowing varnish layer is clear to identify and presents an unnatural yellowing surface across your painting. 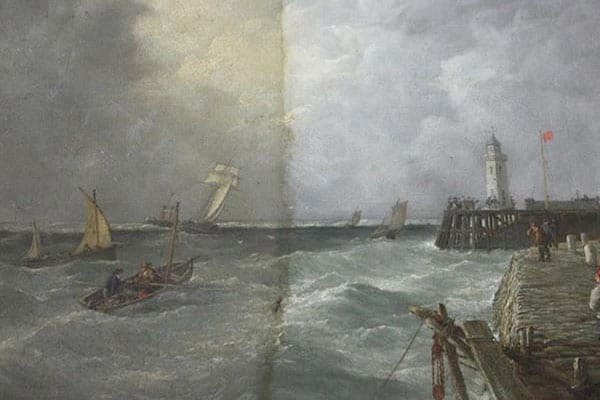 A painting with clouds often expose the extent of discolouration with the whites turning an obscuring yellow. 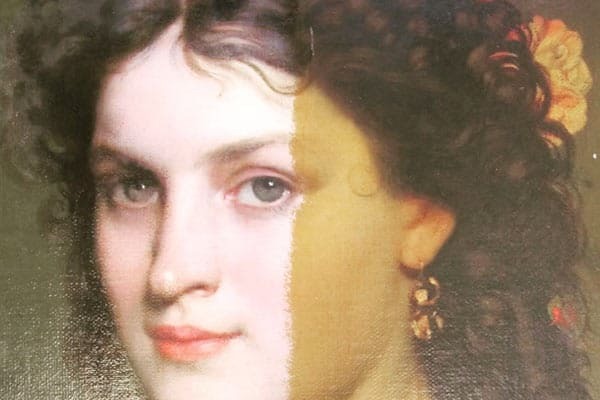 To aesthetically improve your painting and return it to its original condition and colours originally intended by the artist, the varnish layer can be removed. This can be completed by the use of free solvents, solvent mixtures or alternatively Gels (aqueous or solvent) which control the application of solvent to the painting to reduce risks of swelling, leaching and solvent residues in the paint layers. Varnish removal treatment includes extensive testing as each painting presents a different varnish and paint layers which vary in stability. Crucially, the method of varnish removal must successfully remove the varnish layer without affecting the stability of the paint layer beneath. Practice commonly involves solvent delivery by the swab to solubilise and soften the unwanted varnish layer which is then removed by mechanical action of the swab. Although in the field of conservation, efforts are being made to move toward safer and greener materials, often solvents and gels involved in varnish removal are highly toxic and hazardous to health. The correct PPE (Personal Protective Equipment) should be worn including gloves and face respirator and adequate ventilation must be available. In addition, the correct waste disposal methods should be consulted when dealing with chemicals. Is it safe to dust my oil painting? Dirt can be acidic, which presents a danger to the painting as increased acidity may lead to the canvas becoming increasingly brittle. This can result in the breakdown of the canvas structure and vulnerability to mechanical accidents. If the paint surface is stable, without flaking paint and areas of extensive cracking, it’s possible to dust the paint surface with a clean, soft brush. Prior to cleaning, secure the painting on a padded surface. Hold the painting upright at an angle so all dirt and dust falls away from the painting and away from becoming trapped behind the stretcher bars. It is recommended that feather dusters and sheepskin dusters are avoided as they are prone to catch on the surface and it is imperative that household cleaning items are NOT applied to the painting surface.Only a dry cleaning option is carried out at home when assessed safe to do so.